Four ancient tablets discovered in an excavation site at the ancient city of Hazor have been described as the most important ones ever found in Israel. They are the first documents outside the Bible to mention the name of this city, which ‘is referred to in the book of Joshua as one of the great Canaanite kingdoms that dominated the north before the arrival of the Israelites.’ The tablets point to the presence of two royal archives, which it is now hoped will be discovered in further excavations. By the time of Abraham, Hazor was a major centre of commerce. One of the tablets contains multiplication tables, another is about a civil dispute, and a third lists goods sent in trade between cities. Many Christians, concerned that not all details given in the Old Testament have yet been ‘independently’ confirmed by archeology, illogically confuse absence of evidence with evidence of absence. The Bible is from the very start a book about real history, in a real chronological framework. This is just one of the many archaeological finds to confirm incidental details given in the OT. ‘Microbe holds clues to origins of life’ — so reads the headline in a news item published on Time-Warner’s Pathfinder web site. The microbe in question, Methanococcus, was found in the deep sea, in a volcanic vent. It is so different to other microbes that it has been placed in a new kingdom, the Archaea. When these microbes were first discovered in the 1970s, they were pronounced as being ‘ancient’ and it was hoped that study of them would reveal something of how life formed itself on earth. One of these ‘primitive’, ‘ancient’ organisms has now had its DNA decoded. It has about 1700 genes — about the same number as free-living bacteria in the other major kingdom of microbes. The article says its ‘place on the evolutionary ladder remains unclear’. This is an interesting discovery, but has contributed little to the debate over the origin of life. Methanococcus has 1700 genes (each gene codes for a protein), which means it is just as complex as ordinary bacteria. The bacterium Haemophilus influenzae was recently decoded and it has 1732 genes. Methanococcus is not ‘simple’; it is no less complex than bacteria, so is not likely to provide new hope for the naturalistic origin of life. It underlines the point that even the simplest living things are phenomenally complex. According to a forensic biologist at the University of Adelaide, koala fingerprints have patterns which are surprisingly like those of humans, with loops, whorls, and arches. Maciej Henneberg says that although it is unlikely that koala prints will be found at the scene of a crime, police should be aware of the possibility of confusion; their chief suspect may turn out to be cute, furry, and partial to gum leaves. The real puzzle for evolutionists is that human fingerprint patterns are much closer to those of koalas than to those of chimpanzees, which they think are our closest relatives. This means, says Henneberg, that ‘we have two lineage's independently developing the same trait’. Note how evolution theory can use similarities to 'prove' relatedness when it suits, but when it doesn’t, can simply refer to those similarities as evolutionary ‘coincidences’ occurring independently. To have to ‘sell’ evolutionary science in this way seems to indicate that its much–touted value is far from self-evident, contrary to the absurd claims sometimes heard that all of science would collapse in its absence. In fact, if a fraction of the millions spent on speculations into the unobservable past had been spent on basic medical research, for example, we would probably be vastly better off healthwise. Ideas such as ‘advanced’ or ‘primitive’ are based on the bias engendered by mistaken evolutionary views — all organisms are ‘designed to do what they do’, and (post-Fall degeneration aside) do it well. Since a team from NASA announced evidence hinting at past microbial life on Mars (see Life on Mars? Separating fact from fiction), British scientists claim to have found similar evidence in another meteorite. However, in the meantime ‘many leading researchers who study meteorites and ancient life have weighed the evidence and found it unconvincing’. For instance, geochemist Jeffrey Bada of the Scripps Institute of Oceanography announced that his team had studied the same rock the British had, and is convinced that they (and the NASA team) are being fooled by earthly contamination. The pattern of organic compounds in both meteorites is just like that found in the surrounding Antarctic ice, according to Bada’s detailed analysis. Nature 384(6604):3–4, November 7, 1996. ‘Death Knell for Martian Life’ New Scientist December 21–28, 1996 p. 4. Perhaps some of those Christians who rushed to adjust their theology to accommodate this ‘life on Mars’ announcement will learn to be more skeptical of such evolutionary claims in the media. There are comets which orbit the sun every hundred or so years. Every orbit sees a loss of material such that these comets have a life of only thousands of years. If comets came into being with the solar system, then the solar system can only be thousands of years old. The idea of a young solar system is of course totally out of the question for evolutionists who therefore proposed that there must be a source of comets, ‘a nursery’, from which comets get kicked into orbits around the sun to keep up the supply. One hypothetical source is called the Kuiper belt. With great media fanfare it was announced last year that evidence for the Kuiper belt had been found.1 Statistical methods were applied to some very faint blobs in Hubble telescope images and it was decided they were in the Kuiper belt. However, a second look at the same area found nothing2 but there was no media fanfare for this finding. 1. 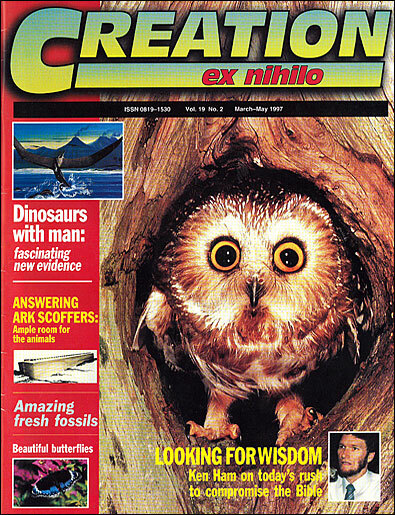 ‘Hubble eyes evidence of comet reservoir’, Science News 147(19):293, May 13, 1995. 2. ‘Second look finds no comet reservoir’, Science News 149(25):395, June 22, 1996. Getting comets into the appropriate orbits around the Sun from such a hypothetical nursery is another problem. Note that if a belt of comet–like objects is ever found it will not demonstrate that the solar system is old. But it is quite possible that such a reservoir has not been found because it does not exist — like the missing links in the fossils. See also Comets and the Age of the Solar System. Cambridge scientists have been reconstructing replicas of ancient musical instruments from fragments. By evolutionary reckoning, some of these date back more than 20,000 years. Far from being primitive and unsophisticated, some of the ‘Stone Age’ instruments were deliberately designed to produce, in addition to normal intervals, the ‘blue’ notes favoured by modern jazz musicians. Some show a pattern of wear over the holes which suggest the players were ‘sliding’ their fingers over them, a technique used by jazz players to ‘bend’ notes. Some early post–Flood people, after the Babel devastation, may have sheltered in caves, but were never ‘primitive’ in any evolutionary sense. Musical instruments were invented in the first few generations after creation (Genesis 4:21). The first elephant had no trunk — so claims Dr Emmanuel Gheerbrant and colleagues at the University of Paris. It was small, about the size of a dog, and did not look anything like a modern elephant. Mammals of that time hid in trees or under bushes and scurried about at night, they claim. And all this is based on? A few fragments of teeth found in a phosphate deposit in Morocco. The growing body of evidence from molecular biology and genetics is leading many scientists to conclude that visible racial characteristics are quite superficial. ‘Race has no basic biological reality,’ said Jonathan Marks, a biologist from Yale University. ‘In the social sense, race is a reality; in the scientific sense, it is not,’ said Michael Omi, a specialist in ethnic studies at the University of California’s Berkeley campus. Professor Cavalli–Sforza, geneticist at Yale University, agreed. ‘Whenever we look under the veneer, we find that the differences that seem so conspicuous to us are really trivial,’ he said. Bible–believers already knew this. If all people on earth are descended from Noah’s family several thousand years ago, then they are all closely related and could not be very different biologically — see The Answers Book, chapter 8, also Acts 17:26. The trivial differences there are should not affect Christian fellowship. Galatians 3:28 tells us that we have unity in Christ.